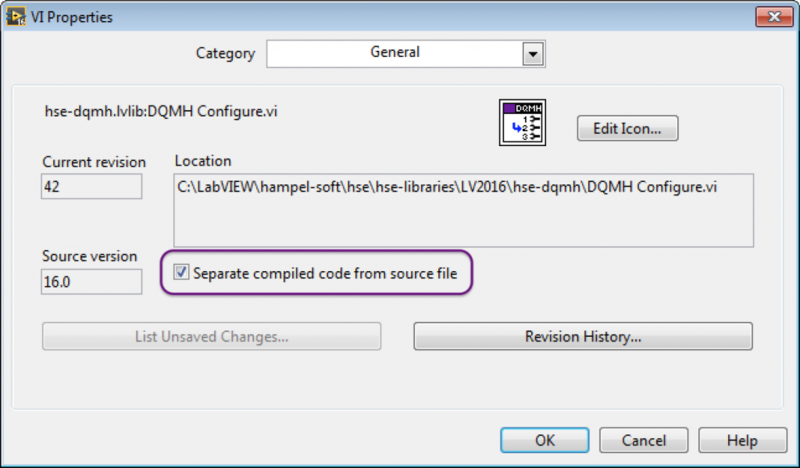 When you change a VI, LabVIEW will update all VIs that have this changed VI as a dependency, and recompile every VI hat is calling that VI, and every VI that is calling the calling VIs, and so on. That’s why you end up with so many “dirty dots”. Technically, LabVIEW does not really change the VIs (i.e. the front panel or block diagram) but only recreate the compiled code for it, which by default is stored together with the front panel and the block diagram in the same VI file. As long as you’re not using Source Code Control, it’s not too much of a bother as you don’t need to do anything but say “Save all”. When you use SCC, though, it will want to update all the VIs that changed on disk, so you lose track of which VIs you actually modified. 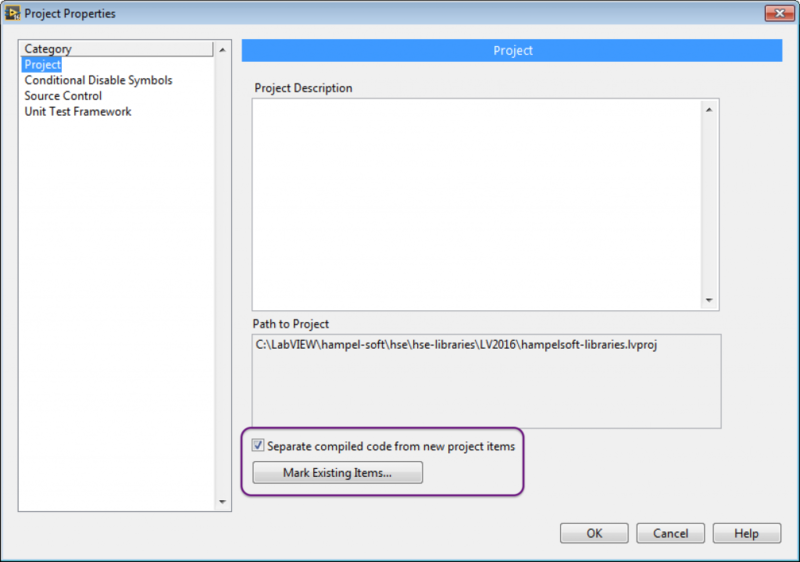 Thankfully, you can tell LabVIEW to “Separate compiled code from source file”, which will do exactly as it says: It stores the compiled code somewhere else (in the compiled object cache). Potential problems: When deploying to Real-Time targets, and/or when deploying updated FPGA bit files, it happened to us a lot that LabVIEW would not actually notice that files changed, and would not deploy correctly. Clearing the compiled object cache seems to help with this and other oddities. There are different ways to enable this feature. For a single VI (or library or class), you can change this setting in the Properties dialog in the General Settings tab (see screenshot above). 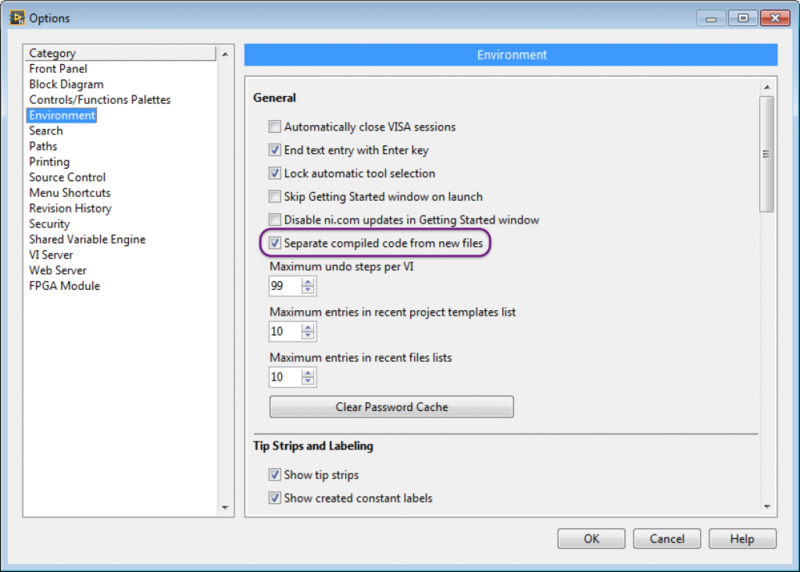 There’s also a VI Analyzer test that checks for this setting in the VI Analyzer Enthusiasts group. Make sure to browse the listing of available community-created VI Analyzer tests while you’re there! I remember when that feature came out in LabVIEW 2010, it finally made it possible to treat LabVIEW as a professional language in source control terms. Without this feature source control of LabVIEW was like trying to do source control of C or C++ where every developer was keeping all the build object and link files in the control system. I really think the Pro, Cons section does not stress enough the huge benefit of selecting this option for any person or team who are using source control and lets be honest here, by 2019 everyone should be. A key feature of source control is the identification of what changes occurred in what files to implement a bug fix or feature. So if you do code review the reviewer code look at those changes or if suddenly you working production software stop or breaks you can identify the files concerned. As somebody who can from a source control background in text languages I remember how impossible it was before this feature was introduced. It would not be uncommon for a team member to change say 5 VIs and then have to check into the source control system maybe 50 or more VIs. It made it very difficult to then identify the original 5 ( there were method of doing and controlling this all horrid and time consuming). Knock on effects of this made it significantly harder to develop large applications in a team with LabVIEW, as cascading recompiled of VIs from different developers working in different areas of the code based could cross in a totally unexpected way. Danny, thanks for your comment. You make some very valid points, and I agree – I’ll edit the pros section to make the huge benefit stand out more. Cheers!